The 1921 Peace Dollar was the first issue of the new series of silver dollars to commemorate the restoration of peace following the conclusion of the Great War. This also represents a one year type coin, as it was struck in higher relief than subsequent coins in the series. While the high relief makes for a stunning impression of design by Anthony de Francisci, it made the coins extremely difficult to strike. This along with other problems caused the mint to alter the design before the first Peace Dollars dated 1922 were struck. Anthony de Francisci was an Italian born artist (born as Antonio in Palermo on July 13, 1887), who had come to the United States in 1905, at the age of 18. Early in his career he would work under artists such as James Earle Fraser, Adolph A. Weinman and Hermon MacNeil, all who had been or would be responsible for the designs of various circulating coinage designs introduced in the early 20th century. These mentors, in particular Weinman (who designed both the Mercury Dime as well as the Walking Liberty Half Dollar), had a large influence on de Francisci. As had happened with the various denominations introduced during the previous decade, a competition was declared to determine the design to be used for a new silver dollar. The origins of the theme for the coin can be traced back to 1918, when a paper was prepared by Frank G. Duffield calling for a coin to commemorate the end of World War I. This was intended to be read at the 1918 ANA convention, which was cancelled due to the Spanish Flu, and in modified form a new paper was prepared by Farran Zerbe and read at the 1920 ANA convention. 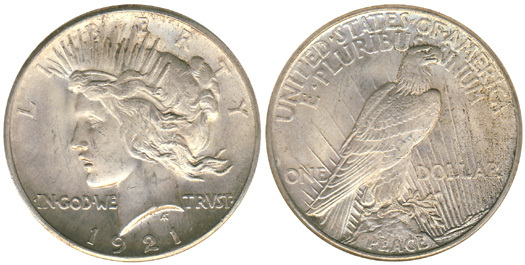 The paper called for a coin, preferable half dollar or silver dollar, with a design representing the ideals of democracy, liberty, prosperity and honor. The silver dollar had been struck in 1921 with the Morgan Dollar design, representing the first production of the denomination in almost two decades. Had the silver dollar denomination not been available for a redesign, a commemorative half dollar could have potentially been issued instead. Commemorative half dollars were regularly issued in the early 20th century, and one commemorative issue had already featured a design by De Francisci in 1920 (the Maine Centennial half dollar). However, the silver dollar denomination was available, and by the fall of 1921 eight artists were working on designs. All had to be done in a hurry, as the first steps were not taken until early November, with the first coins due to be released before the end of the year. The obverse design of the 1921 Peace Dollar would feature a portrait of Liberty, which de Francisci had based on his wife, Maria. The original design for the reverse featured an eagle with a broken sword in its beck, signifying peace, although it was later determined that this might be taken as defeat, and the design was altered. The final design portrayed the eagle standing on a rock, which might be considered one of the most natural looking bald eagles ever featured on American coinage. One of the most important elements of the design is the word PEACE, which is placed on the rock, below the eagle on the reverse. The year 1921 was an interesting one for the silver dollar denomination. First of all, the Morgan Dollar was reintroduced again after a seventeen year production hiatus, and was later that year replaced with the Peace Dollar discussed here. Furthermore, no official proofs were struck at the Mint of this denomination, for the first time since the 1850s, as Proof coinage had basically ceased for all denominations after 1916. All this taken into account and combined with the fact that the first Peace Dollars were not struck until the final week of the year it should not come as a surprise that the total mintage for the 1921 Peace Dollar was relatively low. Over the course of five days from December 26 to December 31, 1921, the Philadelphia Mint struck 1,006,473 Peace Dollars. Surprisingly, this is not the lowest mintage of the series (which was achieved in 1928, when approximately 360,000 Peace Dollars were struck for circulation), and in fact for such a short period, the mintage was quite impressive. Yet, it is a low mintage for any of the silver dollar issues, as those from both the Morgan and Peace Dollar series often had mintages north of 50 million. It is believed that most of the 1921 Peace Dollars struck in that last week of 1921 entered circulation within a few years after their mintage. As such, circulated examples are relatively common, although not seen as often might be expected. Most coins that have survived up to this day are single coins, and any quantity of 1921 peace dollars offered together is a rare opportunity. Q. David Bowers notes in his works that he has never seen a full Mint bag (containing 1,000 coins) of uncirculated 1921 Peace Dollars. Besides the coins struck for circulation, there is also an extremely small quantity of Matte Proof Coins that are known to have been struck, with today’s estimates ranging from 15 to 20 pieces in total. It is believed that no more than 10 are known to exist, with most estimates being closer to 5 than to the former number. They were struck from the same dies as the first circulation strikes (three were sent to President Hayes, while others found their way in the market over time) and are identifiable because of their sandblast or matte Proof surface. Such surface is similar to some of the gold coin Proof issues from the 1910s. These were probably struck as presentation pieces only and not for sale to collectors. Somewhat unsurprisingly for a first year of issue for such a popular denomination, there are a number of high quality examples of the 1921 Peace Dollar that have survived up to this day. The finest known pieces have been graded MS-67, with current population reports showing seven PCGS coins and six NGC coins at that level. It is believed that these figures include a number of resubmissions and that no more than seven or eight 1921 Peace Dollars in MS-67 actually exist. The highest price paid for a 1921 Peace Dollar at public auction was $51,750 realized in August 2006 for one of the NGC MS 67 graded examples. The coin was very original and had an extremely sharp strike, which contributed to the record price. Other 1921 Peace Dollars in the same grade have sold for approximately $30,000 to $40,000. The coin becomes more available in lower grades although gems (graded MS-65) remain scarce and somewhat difficult to find. One of the major problems of this issue is the strike. Because of the high relief, one single strike usually was not sufficient to bring up all the details of the design. As such, finding a coin which is even close to fully struck is difficult, although not impossible. When the relief was lowered for the following year of the series, the striking quality improved. Another issue that plagues the Peace Dollar series, and a situation which is completely opposite of that of the Morgan Dollars, is that toned coins are difficult to find. Most Peace dollars are white or only slightly toned around the rim at most. Rainbow toned coins, as frequently encountered within the Morgan Dollar series, are rare for Peace Dollars and often sell for strong premiums.